What will you benefit from the motivational speakers seminar? 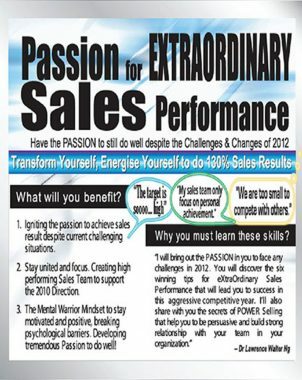 Igniting the passion to achieve sales result despite current challenging situations. Stay united and focus. 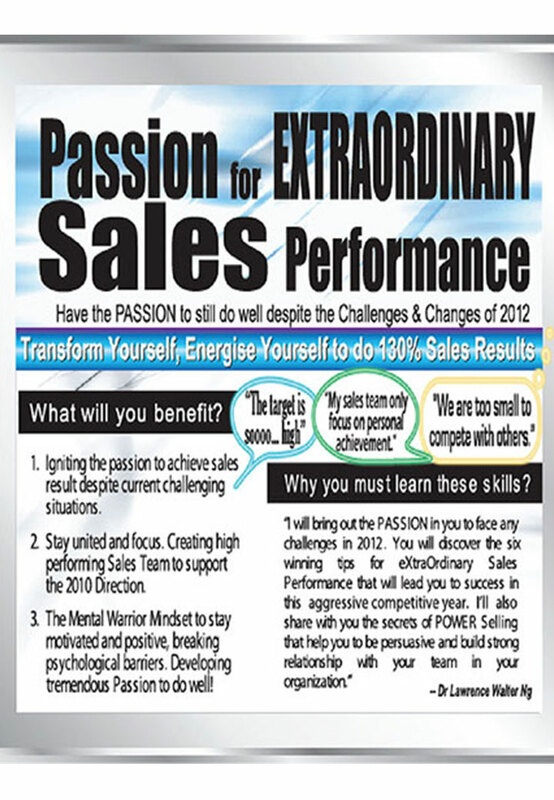 Creating high performing Sales Team to support the 2010 Direction. The best and great motivational speakers seminar with Mental Warrior Mindset to stat motivated and positive, breaking psychological barriers. Developing tremendous. Passion to do well! Rapport building skills with customers / the decision maker. Be the ice-breaker and make your prospects enjoy talking to you. Align with the customer and avoid accidental diversion from customer’s need. Learn to be charming, be talkative, be a great listener. Winning your Customer’s heart easily. Combining a customer’s need. 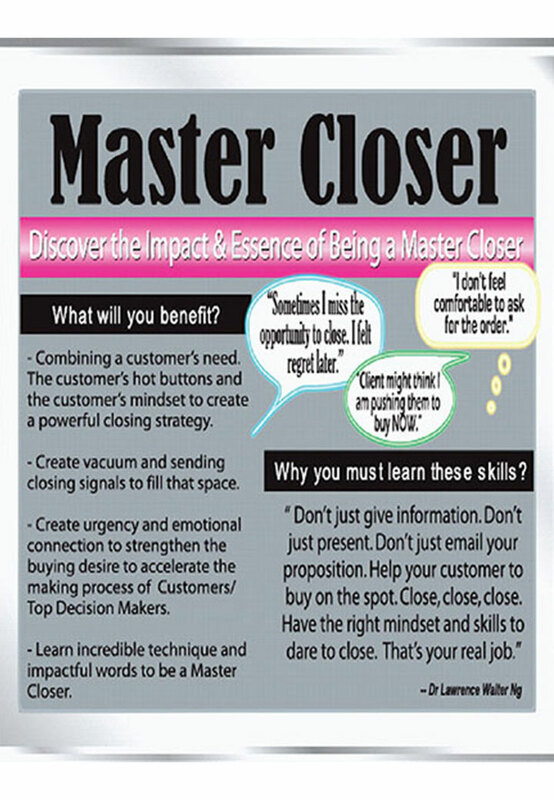 The customer’s hot buttons and the customer’s mindset to create a powerful closing strategy. Create vacuum and sending closing signals to fill that space. 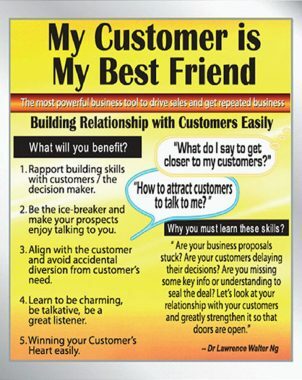 Create urgency and emotional connection to strengthen the buying desire to accelerate the making process of Customers / Top decision Makers. 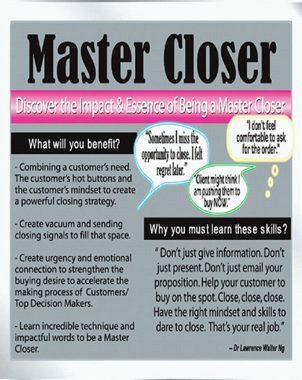 Learn incredible technique and impactful words to be a master Closer. Adopt a new mindsets of Leadership Excellence focusing on Team Transformation. 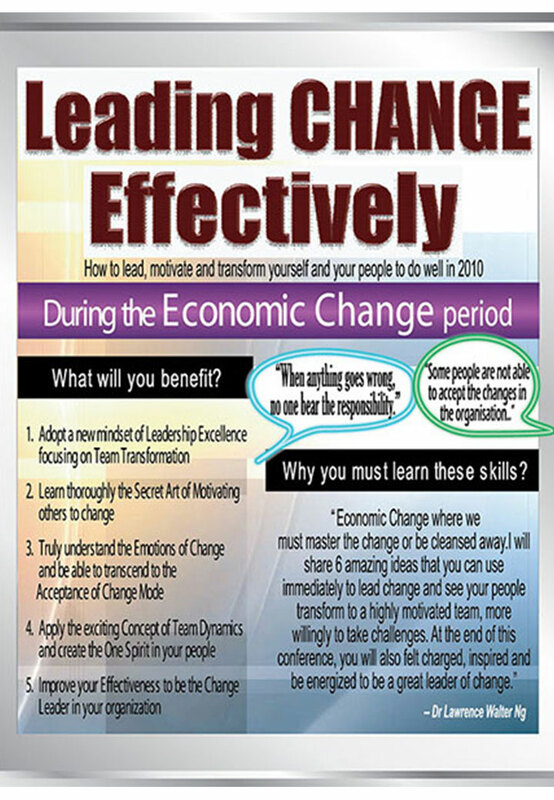 Learn thoroughly the Secret Art of Motivating others to change. Truly understand the Emotions of Change and ne able to transcend to the Acceptance of Change Mode. Apply the exciting Concept of Team Dynamics and create the One Spirit in your people. 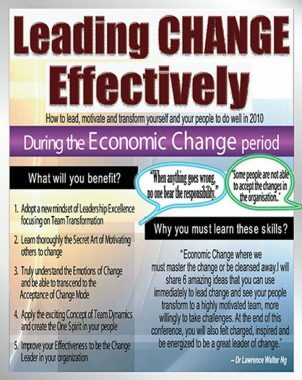 Improve your Effectiveness to the Change Leader in your organization. 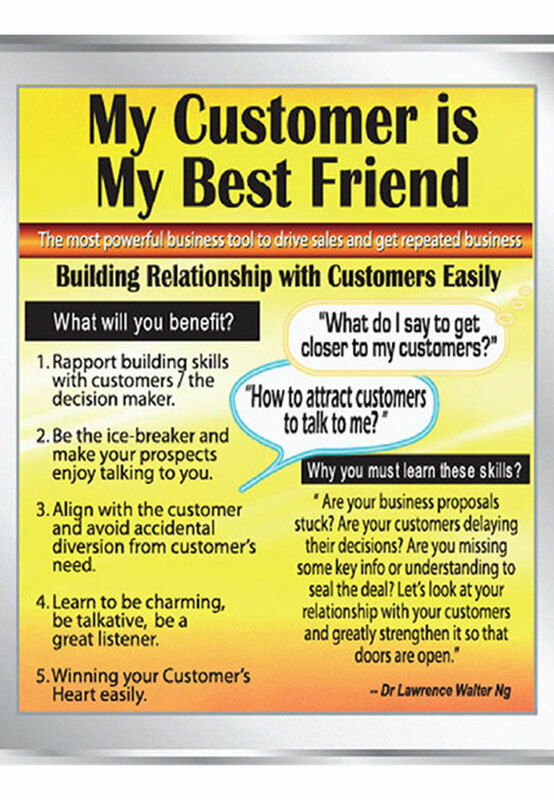 Develop a higher confidence- Customers love confidence! 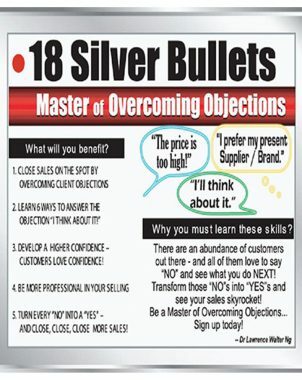 Turn every”NO” into a “YES”- and close, close, close more sales! Being able to read the mind of the customers and speak their language. 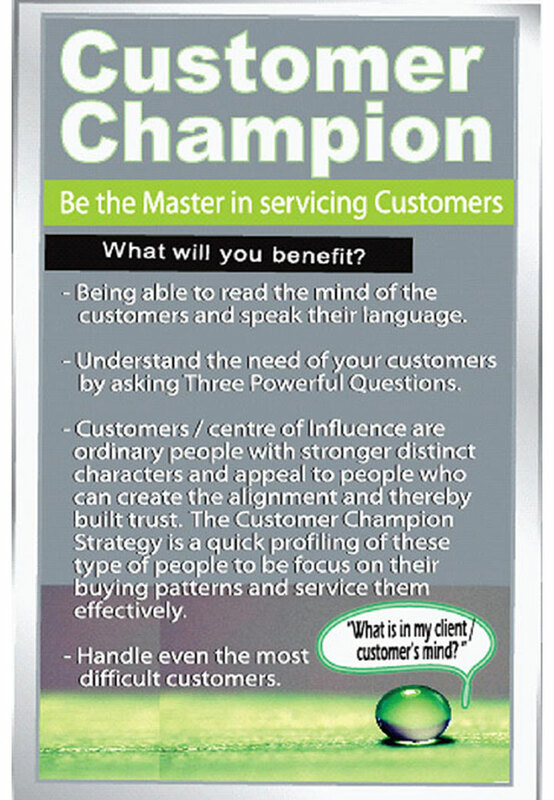 Understand the need of your customers by asking Three Powerful Questions. Customers / centre of influence are ordinary people with stronger distinct characters and appeal to people who can create the alignment and thereby build trust. 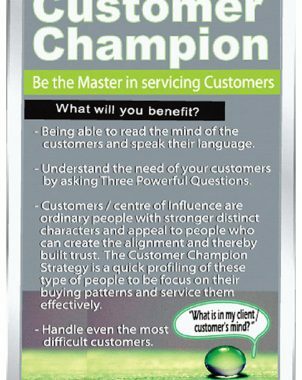 The Customer Champion Strategy is a quick profiling of these type of people to be focus on their buying patterns and service them effectively. Handle even the most difficult customers. Discover where you make mistakes in allowing your customers to press your price down. 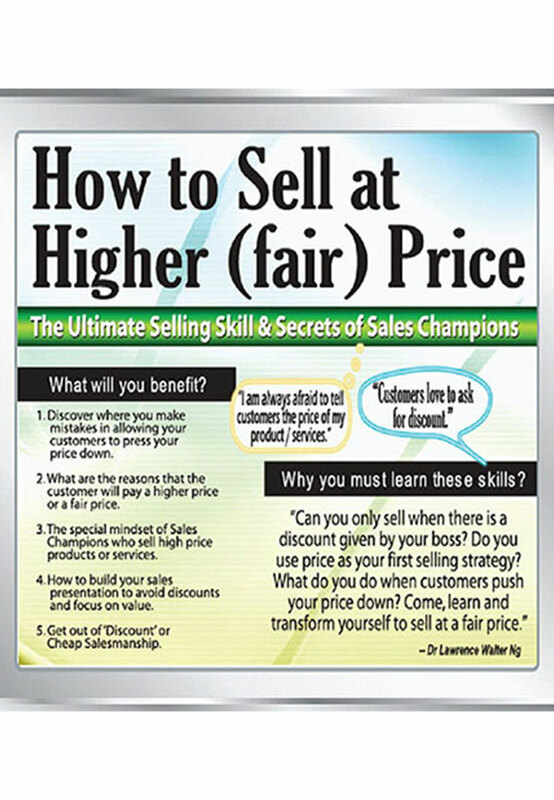 What are the reasons that the customer will pay a higher price or a fair price. 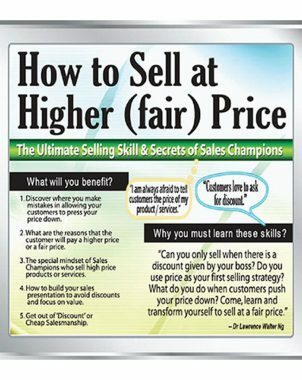 The special mindsets of Sales Champions who sell high price products or services. How to build your sales presentation to avoid discounts and focus on value. Get out of “Discount” or Cheap Salesmanship. Are you ready to stand out and above your competitors in this rapidly evolving business realm? At LWS, our sales training is essential for your personal and business growth. LWS’s sales training is specifically designed to help the sales personnel to improve sales performance as well as increase profitable revenues. 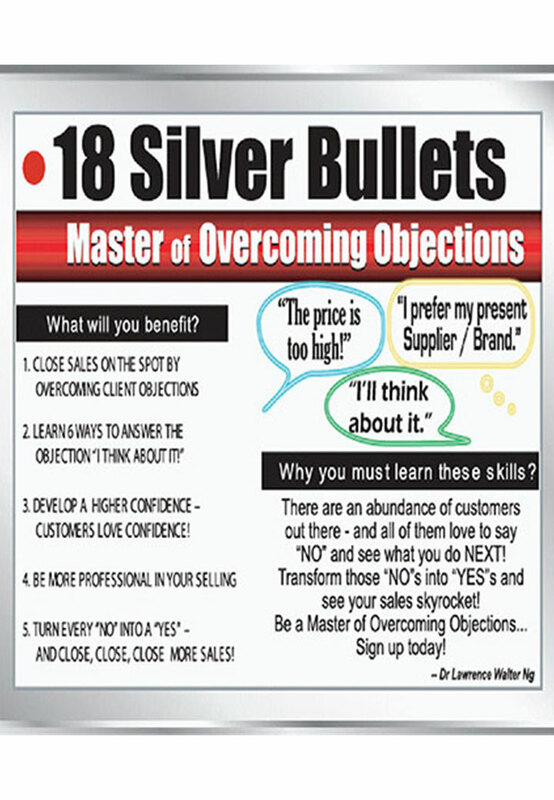 Most importantly, our sales training showers participants with fundamental skills or techniques in negotiating, selling and persuasive speaking, that are particularly useful in businesses. At the completion of the sales training, participants are able to raise their sales performance to the next level and enjoy the positive impact on sales.